Wonderland is a collaborative project by Professor Helen Storey MBE (Helen Storey Foundation and Centre of Sustainable Fashion, London College of Fashion) and Professor Tony Ryan OBE (PVC Science, University of Sheffield) begun in 2005 which examines plastic packaging and explores new approaches to it's use and disposal. Please contact the Helen Storey Foundation for more details and touring enquiries. First shown in 2008, 'Disappearing Dresses' and 'Bottles That Become Flowers' showcased the ideas which Helen and Tony explored within the project. Led by the slogan 'Plastic is Precious', the works were exhibited in Sheffield, London and Belfast. These exhibitions, the accompanying educational site and the story behind the project can be explored here. 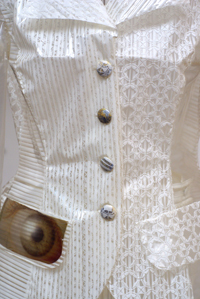 The ‘Disappearing Dresses’ went on to appear at the Royal Academy of Art, London and to tour Europe as part of the Futurotextiles exhibition over 2010/2011. “Wonderful Wonderland! A project filled with wisdom and great people, aesthetically and scientifically raising the awareness of real worries of the world. Making the dresses and seeing them disappear brings a strange sadness but proves that the Wonderland metaphor really works. A powerful project of shared ideas. Scientist Professor Tony Ryan, University of Sheffield. Artist and designer Helen Storey, London College of Fashion. Shining light on sustainability and ethical living. The start of something remarkable. Bottles become flowers at The Botanical Gardens. The visual story at the Millennium Gallery. The dialogue at the University of Sheffield.